The tallest building designed by a Russian architecture firm for the US, which will hold apartments like "shelves in the air", has gained planning approval. 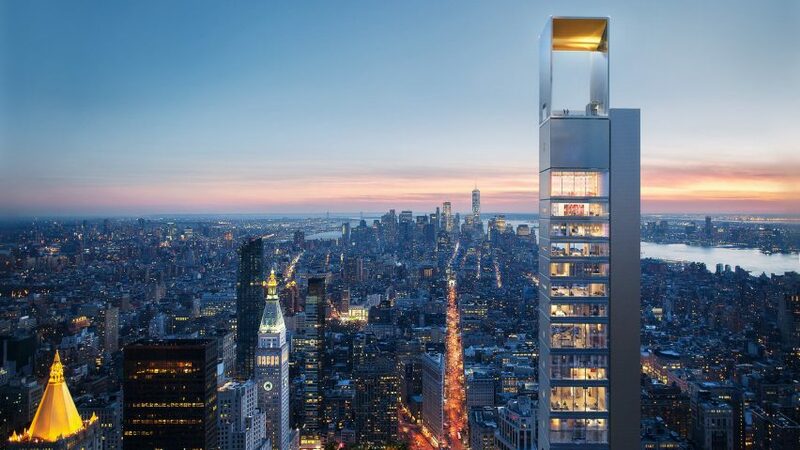 Moscow-based Meganom received the go-ahead to build the 262 Fifth Avenue tower in New York's Nomad district from the city's Department of Buildings yesterday. First unveiled earlier this year, the skinny skyscraper will reach 1,009 feet (307.5 metres) tall and be topped with an observation deck. It will be the neighbourhood's first supertall – between 984 feet (300 metres) and 1,969 feet (600 metres) – but one of many with similarly svelte proportions either completed or under construction in the city. "We didn't want it to be too high, but at the same time be visible and provide better views for the flats," Meganom co-founder Yury Grigoryan told Dezeen in an exclusive interview. "We decided not to be higher than the Empire State Building observation deck, and we are checking carefully not to spoil the view of the horizon, or for tourists." Grigoryan said that the building's structure is unique. Its lift and mechanical systems will occupy a core volume on the western side, which a stack of column-free living spaces will be anchored to like shelves. "It is a completely flexible frame, like shelves in the air with good views," the architect said. "We think that this structure can be the future." Each of the units will measure approximately 47 by 52 feet (approximately 14.3 by 16.1 metres), with 16-foot (4.8-metre) slab-to-slab height and huge windows on the northern and southern facades. Residents will be able to chose the size of their apartments. They can purchase full floors, in multiples, and portions of levels depending on how much space they require. "In terms of architecture it is super interesting that you don't know who is coming and maybe they need more apartments, more sleeping rooms, or baby rooms," said Grigoryan said. Meganom has already developed a "library" of 80 different layouts and plans to host architectural workshops with residents to design the interiors. As well as offering a "unique construction" for New York, the building will features materials chosen to enable a consistent indoor climate during the city's hot summers and cold windows. Triple glazing will be used for the floor-to-ceiling windows, while aluminium will wrap the rest of the building. Smaller circular windows will puncture the eastern wall to open up views, while also giving residents plenty of space for wall hangings inside. Work is already underway on 262 Fifth Avenue. Two empty structures on the plot between 260 and 264 Fifth Avenue have already been demolished. The third, a historic 12-storey limestone building, will be incorporated into the base of the tower, alongside a Japanese-style garden. Although the project is Meganom's first in the US, the firm – which Grigoyan runs with Ilya Kuleshov, Elena Uglovskaya and Artem Staborovsky – is currently working a number of buildings in Russia. He said that country's architects have become more interested in creating public spaces than spectacular buildings during the interview with Dezeen, which took place shortly after 262 Fifth Avenue was unveiled.